If I had a nickle for every time a client came to me and wanted content marketing but didn’t have an optimized website (or vice versa), I could have retired a number of years ago. Too often I see start-ups taking a do-it-yourself approach to both, then wondering why their sales are still low, or why they haven’t made any progress with brand visibility. The answer to all these questions is simple and complex: Integrated strategy. Having a cool looking website without relevant content AND marketing integrations has all the effectiveness of printing out 10,000 business cards, then tossing them into the air on a downtown street corner. Sure, maybe some passerby will find your card who just happens to be looking for someone who does what you do. It *could* happen, but let’s not kid ourselves. It probably won’t. Similarly, Do-It-Yourself marketing efforts often lack a cohesive, comprehensive strategy that identifies your target audience and meets them where they are with content in the form they prefer. For example, many startups set up a MailChimp account, add a subscription form to their website, then send out hastily-written email blasts at random intervals. There’s a fine line between too many and too few emails, and for most DIY marketers, they cross it too soon. Successful email marketing takes time to establish the right rhythm and generate results. Another common error many startups make is in thinking email is dead and they need to focus on social marketing, so they start sharing blog posts and articles, but without any real understanding of best practices or methodology. They do this haphazardly or incorrectly, then after a few months without any real growth in their audience, they give up and declare social marketing a failure. What to do when you’re doing it yourself. At Allied Independent, we always recommend small businesses and startups direct their marketing efforts on owned media. What that means is you put the bulk of your efforts into the channels you fully own and control. You can’t control the outcomes of posts on social media—even if you pay for promotions. But you own your website and your email marketing. When you send an automated email campaign or even a monthly newsletter you know it is going to people who have opted in, people who want to hear from you. If you are determined to wing it—and have the resources of time and energy to essentially learn a new job—there are abundant online educational opportunities where you can learn the basics of marketing. One of our favorite resources is EdX. EdX offers hundreds of tutorials and programs like these business and marketing strategy courses. All are designed to help you learn how to do it yourself, like a pro, and many are free of charge unless you want a certificate of completion. 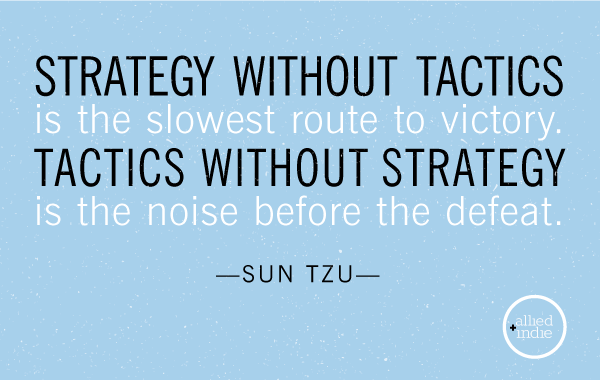 Happy learning, doing, and as we say in the business, “strategerizing”!